“More than a million Japanese encephalitis (JE) cases occurred in mainland China from the 1960s to 1970s without vaccine interventions. 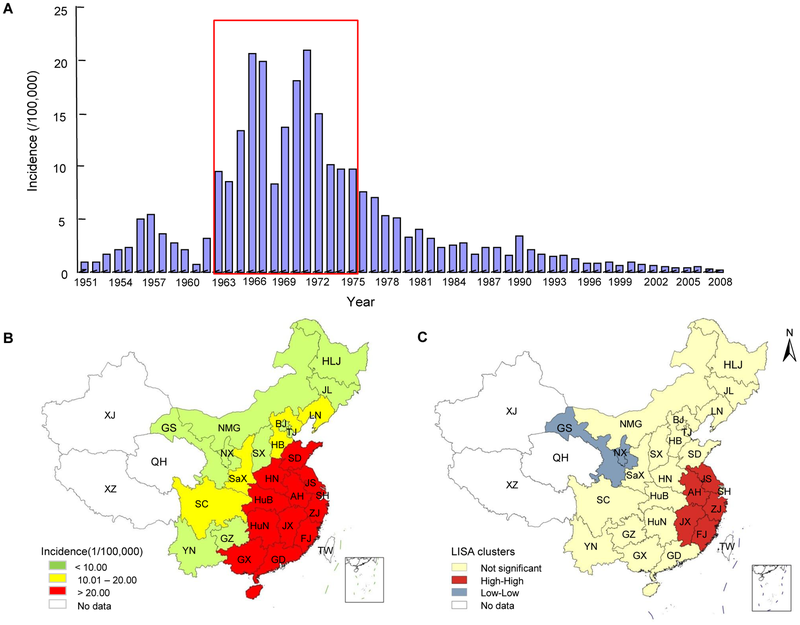 The aim of this study is to analyze the spatial and temporal pattern of JE cases reported in mainland China from 1965 to 1973 in the absence of JE vaccination, and to discuss the impacts of climatic and geographical factors on JE during that period. Thus, the data of reported JE cases at provincial level and monthly precipitation and monthly mean temperature from 1963 to 1975 in mainland China were collected. Local Indicators of Spatial Association analysis was performed to identify spatial clusters at the province level. During that period, The epidemic peaked in 1966 and 1971 and the JE incidence reached up to 20.58/100000 and 20.92/100000, respectively. The endemic regions can be divided into three classes including high, medium, and low prevalence regions. Japanese encephalitis in mainland China during 1963–1975. (A) China experienced a natural JE epidemic period with no vaccine interventions from 1963 to 1975. The bar graph of JE incidence in mainland China from 1951 to 2008 is cited from reference 10. (B) During the JE epidemic in 1971, JE incidence in 11 provinces distributed in the coastal areas of eastern China (red color) was higher than the national average (20.92/100,000). (C) LISA cluster map for JE incidence during 1963–1975 shows the center of cluster in color. High-High indicates a significant (P<0.05) spatial cluster of high JE incidence values; Low-Low represents a spatial cluster of low JE incidence values.